As I wrote in an earlier post about testing my family DNA, it was revealed that on the patrilineal side, my ancestry was about ninety percent Nordic Viking. This was a bit of a shock as the family history always stressed our ancestors were from Ireland and therefore we thought we were of Celtic background. In addition to this revelation, a new television series has aired on the History Channel called “Vikings”. The Vikings were starting to creep into my consciousness. So I began reading “A Brief History of the Vikings” by Jonathan Clements. In recounting what is known of Viking history and the sagas which were written about in the Middle Ages, Clements tells the story of Hrolf the Walker, otherwise known as Rollo or Rolf. Now this is a Viking I knew something about. He was an ancestor of William the Conqueror, the Norman duke who crossed the English Channel and beat King Harold II (Godwinson) at the Battle of Hastings in 1066 to become the first Norman King of England. According to traditions and writings in Norway and Iceland in the twelfth and thirteenth centuries, there was a man named Harald Fairhair who is remembered by medieval historians as the first King of Norway. Harald seems to have been pretty powerful. A great deal of trade was going on between Norway and other countries and Fairhair collected duties on the trade with Iceland and Lapland. There is some archaeological evidence that backs this tradition. He appointed earls who were entrusted with dispensing justice, enforcing the law and collecting taxes. These earls were allowed to keep a portion of what they collected for their own expenses. In return, they were obligated to provide soldiers for the king when needed. Fairhair’s system allowed for a great deal of economic prosperity, especially for the earls and the king. But the smaller landholders were likely disenfranchised. This made for some pretty unhappy Norwegians who couldn’t pay the taxes or protection money to the earls, forcing them from their land. Some of the dispossessed fled across the North Sea to Scotland, the Orkneys, the Faroe Islands, and to Finnmark, Finland and the south Baltic coast. A few of these refugees may have ended up creating more trade for Norway but some created trouble for Fairhair. One of these troublemakers was the son of Fairhair’s associate Rognvald – Hrolf the Walker. Hrolf supposedly got his nickname because he was so large there was no horse big enough to carry him. After spending some time in the Baltic harassing the inhabitants, he must have become tired of this occupation or felt he could do better because he returned to Norway and was attacking in the west. He eventually took his men and ships, travelling to the Hebrides and Ireland and finally the southern shore of the English Channel. Hrolf made many incursions into the territory of the Franks as the French were called then. He participated in the Viking siege of Paris in 885-6. In 911, Hrolf began a siege of Chartres. Many noblemen answered the plea for help from the Bishop and Hrolf was defeated on July 20, 911 at the Battle of Chartres. The result was the Treaty of St.-Claire-sur-Epte. 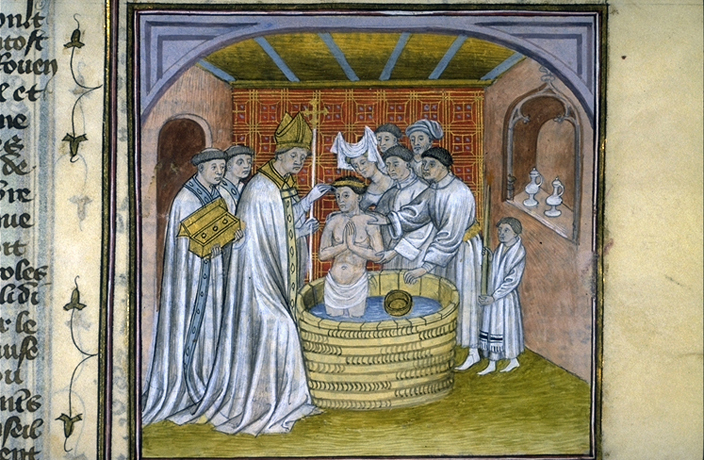 Hrolf swore fealty to the French King, Charles the Simple, converted to Christianity, was baptized with the name Robert and may have married Charles’s presumably illegitimate daughter Gisela. Charles was probably formalizing an existing state of affairs as Hrolf had been in Frankish territory for some time. Charles may have seen an opportunity to create a buffer between future Viking attacks and his kingdom. Hrolf and his soldiers were given all the land between the river Epte and the sea and in return Hrolf promised to end his attacks and give military assistance for the protection of the kingdom which he appears to have provided. Hrolf developed into the head of a Viking aristocracy in his territory. The Scandinavian traditions and language soon vanished. Many members of this new elite adopted the practice of using two names, one ‘true’ Viking name and one more French sounding name for dealing with the locals. They continued their proficiency in battle and ruthless form of politics. Their soubriquet of “Norsemen” turned into the shortened form “Normans” and their territory became “Normandy”. Hrolf and his immediate successors adapted the title of “counts” of Normandy. There are some later medieval sources that refer to them by the Latin title “dux” or in English, duke. Hrolf’s son William Longsword reigned as Count of Normandy from 931-942. The French king came to regret losing Normandy and Longsword had to fight to hang on to his territories. He was assassinated and his young son Richard the Fearless became ruler. He was thrown in prison by Louis IV of France but managed to escape. He combined resources with Hugh Capet, count of Paris and founder of the Capetian dynasty of kings of France. Richard was a strong leader who developed the Norman heavy cavalry and reformed the church. 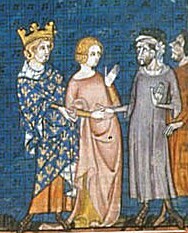 His sister Emma was married to King Aethelred the Unready creating a connection with England. Richard the Fearless died in 996 and his son Richard II the Good continued the policies of his father until 1026. This Richard was the first to undoubtedly be styled Duke of Normandy. Upon his death, his son Richard III became Duke but he died rapidly and suspiciously. While dying young was not necessarily unusual, suspicions fell on Richard’s brother Robert known as the Devil and the Magnificent who nonetheless became Duke of Normandy. Robert never married but he had a liaison with a young woman, Herleva of Falaise and by her had a son named William. When Robert died while returning from a pilgrimage to the Holy Land in 1034/5, he left this young illegitimate son in charge of a rapidly disintegrating dukedom. William would struggle to consolidate his inheritance but with the help of some of his noblemen, he did this and more. In 1066, he gathered an army, crossed the English Channel and by right of conquest, became King of England. One of the greatest legacies and paramount enterprises of the Vikings in the early tenth century was this colonization of Normandy. As we have seen, Hrolf and his descendants came to have an important role in the politics of Europe. They ruled Normandy until 1204 when Philip Augustus annexed the duchy to the French royal domain and eliminated the title of Duke. Hi Susan, I hope you’re having a great day so far. My name is Bonnie and I work for Ezoic, a Google Certified Publishing Partner and the leading artificial intelligence platform for publishers. I’d love to share more about our platform and how it helps thousands of publishers like you. Eudon I of Brittany had property in Beauvais: I believe he inherited it from his grandmother, Ermengarde of Anjou, sister of Fulk Nerra. He was en route from Beauvais back through Normandy when he wrote a letter to his son Alan Rufus commending him on founding Swavesey Priory in Cambridgeshire not long after the Battle of Hastings to which Eudon had committed several thousand soldiers. Caution is advised. The article on Ancestry asserts that Nel 1 lived in 938 and his son Nel 2 rebelled after 1066. How precisely was the Y chromosome identified? Norse is I1 but there is a related I2 from the Dalmatian coast (Croatia, Bosnia, etc) and the rare I2 (Isles) from Ireland. My patrilineal surname is Driscoll and about 2/3 of Driscoll males are I2 (Isles), the others being of the dominant western European R1b (Celts, Saxons, Franks, Basques, Spaniards, Tuscans, etc). The I haplogroup is thought by some to represent the Cro-Magnon migration into Europe millenia before the Indo-European R. The types I and J (Middle eastern) are branches of IJ and cousins as it were of K which is ancestral to R.
My family trace our family history all the way to Rollo the Viking. My family DNA confirmed it. Abby et co: not necessarily Rollo, as he didn’t settle Normandy on his lonesome, and besides, I suspect we don’t have a sample of his personal DNA to compare your father’s with. However, Rollo was an ancestor of Count Stephen of Brittany, who seems to appear in every genealogy of living persons that goes back to 1100, so most of us are probably descended from Stephen and thus Rollo. Thing is, though, Stephen, like his full siblings and their parents, being of Welsh ancestry mostly, including in the paternal line (like the Tudors) had red hair, a characteristic of the Indo-European speakers who brought us the male R chromosomal haplogroup. Whereas, the classic Norse are blond and their men have the I1 haplotype. According to some scholars, the I haplogroup may be characteristic of the males of the first modern humans to enter Europe, the Cro-Magnon people. It certainly has since been isolated to sparse and remote locations such as the mountainous shores of the Adriatic (I2), the Norse countries (I1) and to Ireland where it occurs as the rare I2a (Isles). All of these I1 and I2 populations are blond. Richard of Normandy’s bones are being tested. The results will be out in October. The computer model was made and he’s expected haplogroup is R1b and Gothic. The Goths did go up that way. The computer model was made using all the families that were Rollo descendants and comparing them. They back to a single male ancestor who arrived in Normandy at the time Rollo arrived. What is odd about the whole thing is the computer model is showing hot spots in Three places in Normandy. These correspond to the mythic story that Rollo was related to Harald the first King of Norway. Legend says the Harald was Rollo’s uncle and that Rollo’s father was Ragnvald Earl of the Orkney islands. We shall know more when the results come out in October. http://norwaytoday.info/culture/dna-hunters-unopened-viking-grave-in-normandie/ They did get the teeth and that’s the most important part to get the DNA. 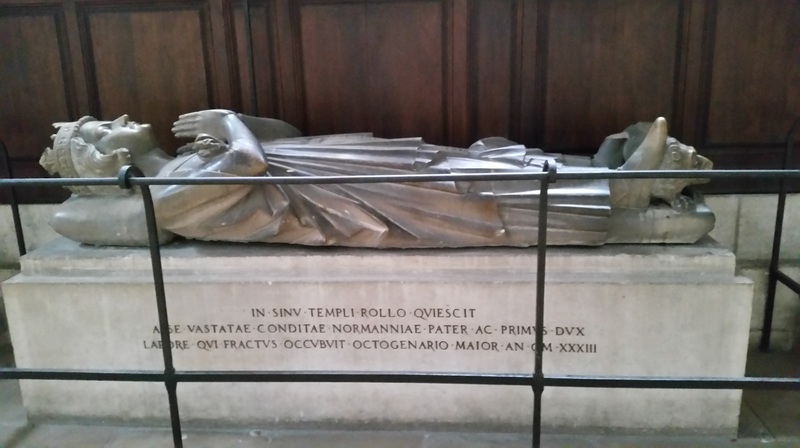 They did open Rollo’s grave in Rouen but they didn’t find any dna that they could use. (no teeth I am guessing) It’s pretty certain that Richard is the great grandson, so we should know soon. Thank you Annie. The results will be most interesting. Great-grandson? So, Richard the Second of Normandy, who married Judith of Brittany? Gothic? In the sense of Gotland in southern Sweden? Has Conan I’s DNA been tested? Three hotspots? Please elaborate. Geographic hotspots? As in tip of the Cotentin? Area round Rouen? Where is the third hotspot? Or different hotspots? Annie, thank you for the links. Interestingly, the second study points to L21, a Celtic lineage, dominant in much of the British Isles, with a less populous branch in Denmark and Norway. Amazing to think what (pre)history may lie behind this! R1a is what used to be called the “Slavic” Y haplogroup. It’s now called “Indo-European”, because it occurs in large numbers of males in both India and Europe. An intersting read that gave great insight into how are ancestors travelled and resettled in other places. I too had no clue I was of Norman and indeed Viking heritage and further back my ancestry says we were spawned from the Alan tribe of northern Iran and travelled north around the time of Christ. My lineage would be that of Williams aid du camp at Hastings and since then the Pomeroy family has done quite well in many centuries up to present day. We are also linked to Ireland as we have a Viscount their as well as many many other fascinating historical tidbits that I am sure I’ve not yet read about . Thanks for the read !!! Yes, the Alans interbred especially with the Celts who shared their love of horses, and with it, chivalry. The Clive Owen “King Arthur” movie at least got that right. The irony is that Romans hostile to the Britons used the Alans to attack them, only to discover that the two groups soon got along like long-lost twins. Germanus of Auxerre, a much more sympathetic pro-British figure than he is portrayed in the movie, was an earnest go-between in this process. The greatest, and humblest, of all knights, Count Alan Rufus, was named for his ancestors the many Counts, Dukes and Kings of Brittany who gladly bore the name “Alan” following the merger of the two peoples. This is a great story, thank you, Susan! Sorry I’m late with this, Susan! This was great, and answered a LOT of questions I’ve had on this topic. Thanks!! Possibly a dozen well known Scottish clans and families have Norse origin. Best known is Ferguson/ Farquharson. The coat of arms of Clan Campbell feature a ship which is recognizeable as a Viking longboat. And of course one the greatest pieces of Icelandic literature is Njalssaga — the story of a man named Neal. I’m sorry Bruce, but ‘Fergus’ is a very well konwn Celtic name and the Scotsmen of this period used vessels which were coarsely imitations of the Viking ones. The most probable view on the origins of the Fergusons is that they were among the early Scots of Dal Riata. If you have not seen “Secrets of the Viking Sword,” a documentary available on Netflix, you should definitely see it. The documentary weaves the history of a unique type of sword owned by Viking noblemen in the period 850-1000’s with the story of a modern day smith attempting to make one. The sword was of superior quality steel which gave the user a big advantage over users of ordinary swords. The “Ulfberht” sword was probably the first branded product. There were even knockoffs. The last scene of the modern sword being quenched in oil is really something you don’t want to miss. Sounds great Doug. I’ll look for it. Well I just finish reading this great post, and as always I enjoy the lecture and I learn something new , when I am reading all this post at the same time I am taking notes because of the names: Richard the Fearless, you write here that his was thrown in prison by Louis iv of France but he scape, I think I have read this part before, and is very interesting, and something that I learn before, is about the Capetian Dynasty and the founder was Huge Capet, you know the first time I read about Marie Antoinette and her husband, they mention that when they thrown him in prison he now longer was King Louis xvi he was call citizen Capet, I said what is that Capet?? so I start doing my research and I found out about Huge Capet, I was in 8th grade. Well all this is so interesting, the other person is Aethelred the Unready like all this, very good post, and now I know that my friend Susan ancestries are Vikings. I will continue reading all your posts. Thank you Anna. And that explains the name! Really interesting, Susan! I can imagine your delight and fascination at the ancestry results. I didn’t know the details of how Normandy came about, and Rollo or Hrolf does sound like a larger than life character. That’s very true! That reminds me of another ‘giant’ of a man whose grave or casket was found – I was reading about this recently. He was of Norse origin, too. (I will have to find this now!) All this proves that you didn’t mess with a Viking! Susan, I don’t know about your ancestry, but you do look very Nordic. Forget Ireland! Rollo is an excellent choice for an article. I’ve had other people tell me the same thing periklis! Thanks, I find Rollo fascinating too. That’s a great story Susan. As far as I know Viking descendants still controlled much of the Orkneys and Shetland Isles up to the time of Robert the Bruce . In 1276 Vikings coming from Denmark/Norway made a journey with 30 ships to invade the Scottish coast. Yes Bruce that is correct. The Treaty of Copenhagen in 1468 gave the Orkneys and the Shetland Isles to Scotland in a settlement for an outstanding debt. And James III King of Scots got Margaret of Denmark as a wife too! Thanks for reading. your series is excellent. Thanks!